The 7.62x54R is a rimmed round developed and put into service by the Russian Empire in 1891. The R on the end refers to the cartridge being rimmed. The 7.62x54R calibre is used in most models of the Moisin Nagant bolt action rifle used by the Russians in the first and second World Wars. The cartridge is still used in some models of the Kalashnikov rifle, notably the SVD Dragunov sniper rifle and PKM machine gun due to its performance which is comparable to the .308 cartridge. 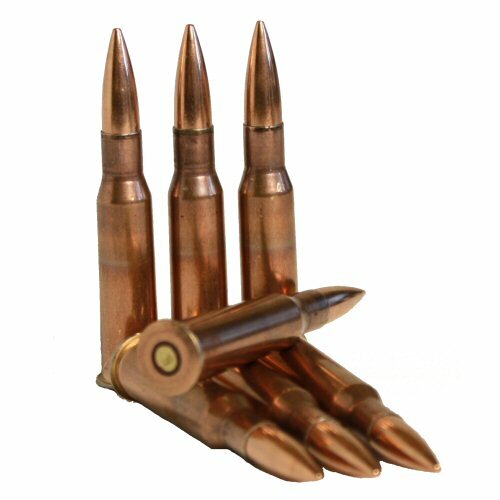 The inert bullet consists of a fired brass 7.62x54R copper plated steel case re-headed with an FMJ head. The inert round contains no live ignition system or propellant and is therefore inert. Can be used for re-enactment, collection, display, diorama or film and theatre. Price is for ONE inert round only. NB: All inert ammunition travelling OUTSIDE mainland UK must be shipped by international courier (eg TNT, DHL).